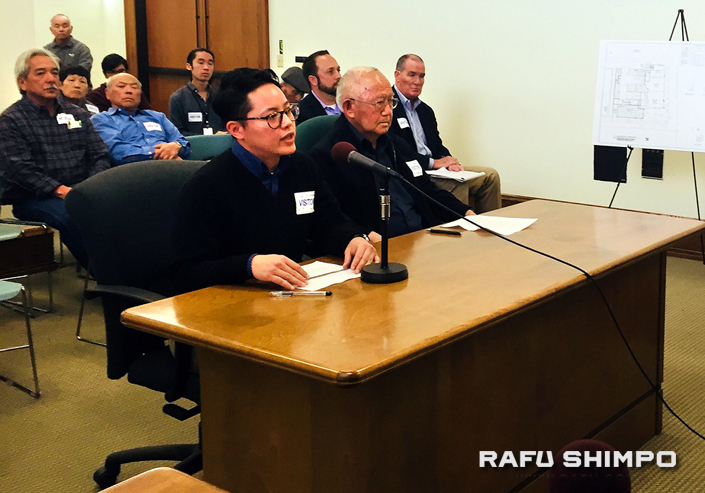 Rey Fukuda (left) and Yukio Kawaratani express their opposition to a proposed 7-Eleven in Little Tokyo at a hearing before L.A. City Associate Zoning Administrator Fernando Tovar on March 7. A move to block the construction of a 7-Eleven convenience store in Little Tokyo has gained the support of Los Angeles City Councilmember Jose Huizar. Approximately 25 residents, business owners, and community leaders appeared before the city’s Associate Zoning Administrator Fernando Tovar on March 7 to voice their concerns that the planned 7-Eleven convenience store could undermine safety in the area. “We are concerned that the proposed project’s operations will adversely impact the welfare of the surrounding area, which faces significant public safety and security challenges. The community has worked extensively on visioning and planning for the neighborhood, and locally owned and community-based small businesses are core to the fabric of the Little Tokyo community and embedded in the goals of the Community Plan,” Eberle said. The 7-Eleven would be located at 220 E. Second St. in the AVA apartment complex, a 127-unit, mixed-use development operated by Avalon Bay. Recently, a 7-Eleven located less than a mile away at Fifth and Broadway was closed because it became a hangout for transients and drug dealers. “7-Eleven has a few other locations in Downtown, and all have been widely noted by the community as highly problematic, due to reasons including poor maintenance, loitering and illegal activity. We do not have confidence that the proposed operation would be compatible with the surrounding neighborhood,” Eberle said. Main objections are based on the store’s proximity to Skid Row; its plan to operate 24/7 with alcohol sales between 6 a.m. and 2 a.m.; and nearby child-centered programs, including the Casa Heiwa day care center, Little Tokyo Branch Library, and the soon-to-arrive Terasaki Budokan recreational facility. AVA resident Cindy Lamar testified that her main concern is safety. She said that AVA has only one security guard who covers the complex’s two large buildings. David King, whose restaurant, Baldoria, is in the Wakaba apartment building adjacent to AVA, concurred with Lamar. Yukio Kawaratani, a former city planner, expressed concerns that the store’s persistent bright lighting could impact AVA residents and DoubleTree hotel guests. In addition, the size of the new store — 4,087 square feet — is nearly twice that of a standard 7-Eleven. He also worries that the lack of parking in front could lead to illegal double-parking. Adan Madrid, representing ASI Development, pointed out that 7-Eleven is a Japanese-owned American corporation headquartered in Irving, Texas. There are nearly 20,000 7-Eleven stores or konbini in Japan with more than 2,600 in Tokyo alone. 7-Eleven’s reputation is quite different there compared to the U.S., where there about 8,000 stores. Japan’s 7-Eleven’s have Wi-Fi and offer fresh food that is delivered fresh to stores three times a day. Madrid added that his company is seeking a member of the Little Tokyo business community to become the franchisee. He said he hopes to be able to sit down with community members to work out conditions under which the 7-Eleven would be allowed to operate. Tovar emphasized that his authority is limited to the 7-Eleven’s liquor license and hours of operation. He agreed to wait 30 days, allowing for any pertinent data to be submitted by Little Tokyo stakeholders, before making his determination.